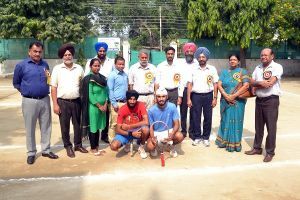 Punjabi University Inter College Lawn Tennis Championship began at M M Modi College here today. Sh. Tarsem Lal Gupta, Chief Coach (Boxing), NIS, Patiala and Sh. Saran Joy, Arjun Awardee (Boxing Coach), NIS, Patiala inaugurated the tournament. Sh. Tarsem Lal Gupta appreciated the achievements of the College in sports and motivated the sports persons for higher achievements. The College Principal, Dr. Khushvinder Kumar welcomed the guests and said that sports not only inculcate the sense of discipline, they also provide us training of the mind to accept outcome of the efforts. Winning or losing the game is not a material issue, participation and dedication is the prime motive of the sports. During the preliminary matches Punjabi University, Patiala, Modi College, Patiala, Govt. Mohindra College, Patiala and National College of Physical Education, Chupki entered the semi-finals. Modi College, Patiala defeated Govt. Mohindra College, Patiala in the first semi-final. The final contest will be held tomorrow. Dr. Gurdeep Singh, Dean (Sports) of the college conducted the stage during the event. College Sports Officer Sh. Nishan Singh and Ms. Mandeep Kaur made meticulous arrangements for the tournament.